One purchase, one small piece of paper. In this world, each deal is not simply the exchange of goods for an amount of money : it also ends with the printing of a sale receipt. Their destiny is multiple. Some are immediately discarded when buyers leave the store, others are on the contrary carefully preserved. On the one hand, all these small pieces of paper fill trash cans and recycling supply chains in an economy heading towards compliance with environmental requirements. On the other hand, sale receipts gradually swell the wallets of buyers who archive them. Coping with their daily swarm, a time frame to sort them out is necessary. The type of goods is often decisive: already consumed foods have no other referents than this piece of paper, while many other items need proof of purchase for a possible exchange. 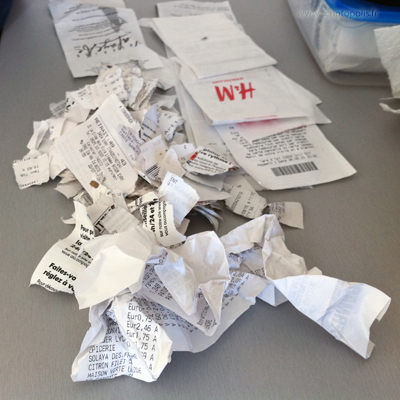 Over time, some receipts are losing their value, while others keep their entire force. One purchase, two small pieces of paper. Sales receipts also piled in each place where they are printed. For these instances issuers, they keep track of purchases day after day and thus make it possible to draw up the balance sheet. Archiving them is crucial, as the copying of their content in other documents: account books, bank statements… Put together by the day of the week or the month, these small pieces of paper then draw simultaneous paths in multiple places. They forge links as weak as indispensable to the biography of people, goods and organizations that live in our world.